Online Income Builder Program Reviews - Legit or Scam? Online Income Builder Program Reviews – Legit or Scam? The main advertisement for this new business opportunity can be found on this site, www.IvanAndAlicia.com. This web page tells the story of Ivan and Alicia Levine and their rise to success using the Online Income Builder Program. They claim that by using this resource they were able to build a thriving eCommerce business focusing on educational children’s toys. The rest of the website is a sales pitch for the program trying to convince you to purchase the product and try your own hand at building an online business. This whole thing is a Robert Allen venture – real estate author turned make money online guru. This is his second product related to online business and as a bonus he includes his previous works. 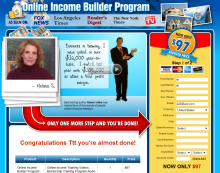 Is the Online Income Builder Program a Scam? It’s hard to judge this program based on the testimonials alone, the disclaimer at the bottom of the page states that those whose stories have been featured on www.theonlineincomebuilder.com were compensated. It’s also hard to judge the success of the featured clients Ivan and Alicia since they do not share the URL of their website. It’s understandable not to want to share a successful website due to fear of revealing your niche and opening yourself up to competitors. Having the website would allow you to check their traffic stats and see if their income claims in the testimonials were feasible. If you go based on Robert Allen’s reputation then the results are at best mixed. His previous course, the one that’s included in this new package was rated 2.06 out of 5 based on 131 reviews. Although Robert Allen’s Online Income Builder Program is new, most of the people who buy it will not make any money and do not apply its strategies. The company may use Individual Information to provide promotional offers to individuals by means of email advertising, text/short message services, telephone marketing, direct mail marketing, online banner advertising, and package stuffers, among other possible uses. Robert Allen has been associated with Prosper Inc, a third party business coaching service for quite some time. Many business opportunities such as this pass on their leads to companies like Prosper Inc for a cut of the coaching commissions. Prosper coaching can cost over several thousand dollars so it’s a very lucrative way to supplement their incomes. If you purchased the program and would like to request a refund or speak to a customer service representative you can do so at this number 1-866-448-4593. Yes it is possible to make money online but it is fairly difficult and the people doing it are tech savvy or have access to serious resources that assist them in building an online business. You cannot expect to make money with no online marketing or business skills simply because you see some advertisement and purchase an eBook. This is precisely why gurus like Allen get lots of bad press and negative reviews; it’s insincere to market courses like this to the general public knowing that the majority of your customers will not make any money and simply get an “education” as they put it. Online Income Builder Program ?